M•A•C is the official makeup partner for King Kong. In celebration of ArtsConnection’s 40th anniversary, a joint after-school program has been created in association with Broadway’s King Kong, with support from the Mayor’s Office of Media and Entertainment. 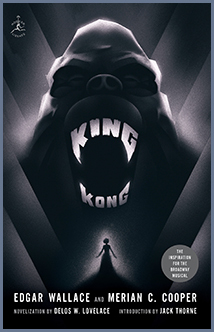 The Modern Library is the proud publisher of the original novelization of King Kong by Edgar Wallace and Merian C. Cooper; featuring a new introduction by Jack Thorne, the Tony®-winning playwright of King Kong. Take a journey around the globe in the heart of Times Square. Explore a 50,000-square-foot world of miniatures. Gulliver’s Gate will ignite your imagination and shift your perspective. Save $7.50 when you buy your Adults/Seniors/Children (General Admission) ticket at the box office only using code KingKong. Offer valid until December 31, 2019. Give the gift of an unforgettable experience in NYC when you stay with Hilton this holiday season. Book now! Get your selfie sticks ready. Madame Tussauds New York in the heart of Times Square is the only place with no ropes or barriers holding you back from your favorite stars. Voted as one of New York’s most unique attractions, Madame Tussauds invites you to pose “in a moment in time” with the world’s most iconic musicians, A-list stars, sports legends, world leaders and more. With over 85,000 square feet of interactive entertainment, including Mission: Undead Experience and Marvel Super Hero 4D Experience, the world famous wax attraction is bigger and better than ever. Get $5 off Gold Admission with promo code KONG5. Hop on the TCM Classic Film Tour for a one-of-a-kind sightseeing tour of the Big Apple and explore the most filmed city in the world. See the Empire State Building featured in King Kong, take pictures where Marilyn Monroe's skirt flew up in The Seven Year Itch and visit Holly Golightly's apartment from Breakfast at Tiffany's to name a few. Save $5.00 when you use code Kong. © 2019 KING KONG ON BROADWAY. Subscribe to our mailing list, and be entered to win 2 free tickets!